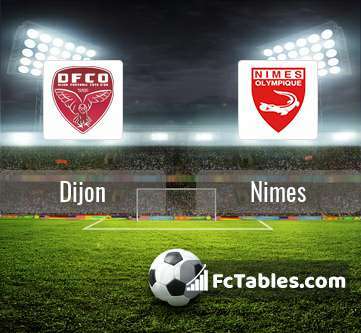 Match Dijon-Nimes Ligue 1 the fixture is set to kick-off today 19:00 on Municipal Gaston Gerard. Refereee Frank Schneider. Team Dijon currently is on lower place in table (17 position). Form team looks like this: In the last 5 matches (league + cup) gain 1 points. Dijon from 8 matches can not beat any rival. Players Dijon in Ligue 1 with the highest number of goals: Julio Tavares 3 goals, Jules Keita 2 goals, Mehdi Abeid 2 goals. Players , Jules Keita 1 assists will have to be very well guarded by defenders Nimes, because they have the most assists. Injuries in the team Dijon: Frederic Sammaritano, Chang-Hoon Kwon. Team Nimes currently is on lower place in table (16 position). Last 5 games (league + cup) finished balance 3 points. Nimes did not win the match from 9 games. The most goals in Ligue 1 for Nimes scored: Sada Thioub 2 goals, Antonin Bobichon 2 goals, Renaud Ripart 2 goals. Most goals developed: Sada Thioub 2 assists, Antonin Bobichon 1 assists, Renaud Ripart 1 assists. In Nimes not occur in the match due to injury: Mustapha Diallo, Pierrick Valdivia. Direct matches: usually ended with winning of Dijon. 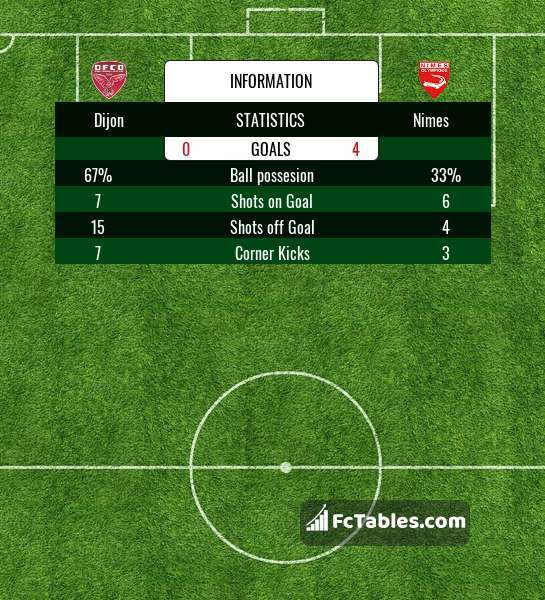 Balace of both teams games are: 7 won Dijon, 4 wins Nimes, 4 draws. In 8 matches the sum of the goals both teams was greater than 2.5 (Over 2.5). On the other hand, 12 matches teams scored more than 1.5 goals (Over 1.5). In 11 matches the both teams have shot at least one goal.